Superhot is a shooter where time only moves at normal speed when you do. 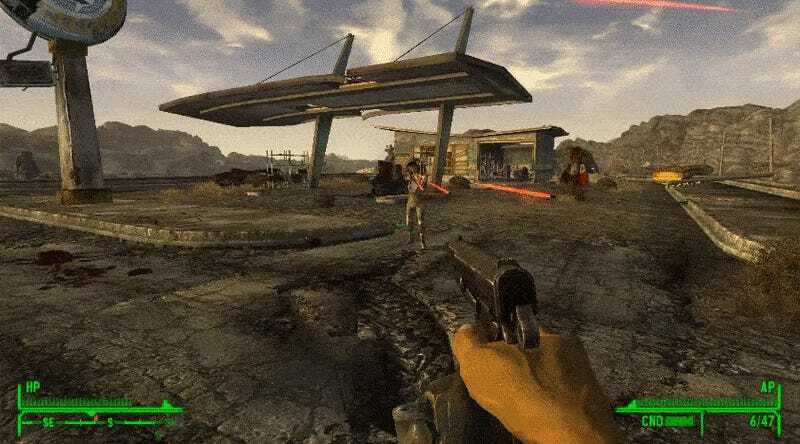 Thanks to a very impressive mod, so is Fallout: New Vegas. SUPERVATS. It’s all there: weaving between bullets, deflecting bullets with a sword, slashing enemies to ribbons, etc. People don’t get quite so... explodey in Superhot, but it’s like my grandma always used to say: the more entrails, the better. Don’t ask. The mod’s not out yet, but it should be soon. Also worth noting: this person is making a flyable fighter jet for Fallout: New Vegas as well. Fallout 4's Creation Kit might be around the corner, but there’s life left in the desert yet.